These frog legs are battered and deep fried to perfection. 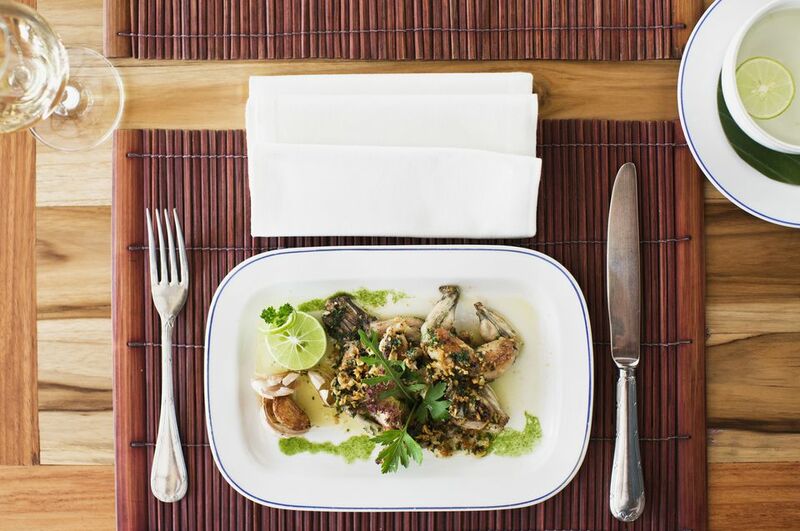 The frog legs are first marinated in a mixture of lemon juice and water, and then they are coated and deep fried. Add some herbs and spices to the lemon juice and ice, if desired. Wash frog legs thoroughly. Place in a large bowl; sprinkle with lemon juice, and cover with crushed ice. Refrigerate the frog's legs for 30 minutes to 1 hour. Heat the oven to 200 F or warm setting. In a deep saucepan or skillet or deep fryer, heat about 2 inches of vegetable oil or melted shortening to 375 F.
Line a large rimmed baking pan with paper towels. In a medium bowl, whisk together milk, egg yolks, and 2 teaspoons oil. Beat the egg whites until stiff; fold into milk and egg yolk mixture. In another bowl, combine the flour and garlic powder; blend well. Sprinkle the frog legs with salt and freshly ground black pepper, and a little cayenne pepper, if using; dip each frog's leg in milk-egg mixture, then dredge in the flour and garlic powder mixture to coat thoroughly. Working in batches, fry the coated frog legs in the hot fat until golden brown, about 2 minutes. With a slotted spoon, transfer to the paper towel-lined pan to drain. Put them in the preheated oven to keep warm while frying subsequent batches.